An informational meeting was held on January 20, 2019 at the headquarters of the World Health Organization in Geneva in the light of the 144th session of the WHO Executive Board, chaired by the Regional Director of the WHO Regional Office for Europe Ms. Zsuzsanna Jakab. The meeting was attended by the delegations of the member countries, representatives of international organizations, as well as ambassadors, Permanent representatives accredited in Geneva. 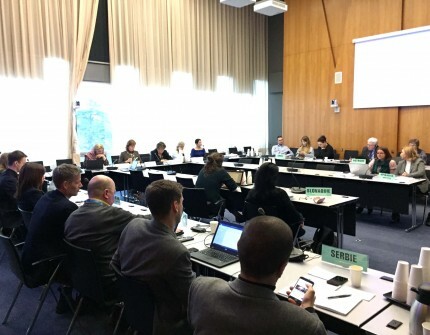 Participants discussed issues of particular interest to the organization’s member countries, including administrative, budgetary matters and the program of the World Health Organization for the coming period. In the framework of this meeting, the Ambassador, Permanent Representative of Turkmenistan in Geneva, made a statement, in which he introduced the participants with information about the first international conference on the prevention and control of non-communicable diseases held in Ashgabat on December 3-4, 2013, the outcome of which was the Ashgabat Declaration, which was later approved by the WHO Regional Committee for Europe in 2014. In this context, it was announced about the second high-level international conference, which will be held in Ashgabat on April 9-10, 2019, dedicated to the prevention and control of non-communicable diseases. In particular, the structure of the conference (high-level plenary discussions, meetings of thematic sessions and interactive working groups), the main issues to be discussed by the participants of the Ashgabat conference were presented to the participants. In conclusion, all member countries were invited to send high-level delegations to ensure high efficiency of the upcoming conference; at the same time, they noted that the diplomatic missions of Turkmenistan abroad will also provide the necessary assistance to all delegations to participate in this Conference.